Made with the traditional system, reinforced by the latest technological advances. They keep a distance and equilibrium point between the young and aging wines. Young: Temperature: 5-7 ° C.
Traditional: Temperature: 6-8 ° C.
AIRÉN: pale yellow wine with greenish light, changing to lemon yellow with age, with major fruity aromas, fine and fresh. Wines are light on the palate, which invites the taster to a second drink. CHARDONNAY: Wine pale yellow, becoming more intense with age, with characteristic primary tropical aromas of pineapple, banana and melon. They are very apt to ferment in barrels. Produce aromatic wines with high potential, with great body and structure, well suited for aging. SAUVIGNON BLANC: Wine-known for its strong aromatic potential, offering a perfect marriage in the “blend” with other varieties, such as the Airen and Macabeo. They have a high acidity with flavors of fresh cut grass and currant leaves. Widely used in the wine trade pretty young straw yellow color. On the table, just like whites wines, pink wines are recommended to accompany seafood and fresh cheeses. CENCIBEL OR TEMPRANILLO: The Pink Cencibel or Tempranillo variety wines are bright, cherry pink, which makes them especially attractive to the eye. Varietal aromas are reminiscent of prunes and liquorice in flavor. They have a soft palate, with moderate body, balanced, rich and fresh. GARNACHA: These wines are the result of a technological process that produces a bright pink wine, strawberry, with ruby hues which are very clean, bright and vivid. These Varietal aromas are reminiscent of wild fruits. The wines have a smooth mouthfeel, tasty and balanced. Much of LA MANCHA’S pink wines come from this variety. In the table, young red wines go with fish and meat, while the traditional wines, besides going well with meat, are also suitable to be served with fish and cheese. CENCIBEL OR TEMPRANILLO: Wine with cherry ruby tones. With varietal aromas which are reminiscent of prunes and liquorice in flavor. Full mouthfeel and firmly structured, which leaves a characteristic aftertaste, very typical of the variety. CABERNET SAUVIGNON: These are wines with beautiful raspberry-ruby tones, which have floral aromas and a deal of nuances. The mouthfeel is elegant, yet astringent to the palate if one is not accustomed to it. 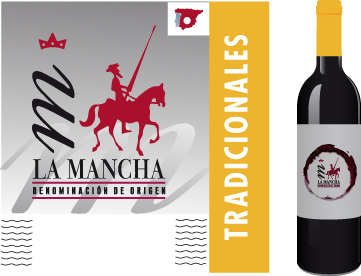 GARNACHA: Wines particularly suitable for pairing with other varieties such as Tempranillo and Cencibel or Moravia. It was developed as a single-variety produce of aromatic wines with great body and low acidity, prominent in roundness and structure, when it blends with other varieties, it is proportional to the bouquet which the winemaker aims to provide. MERLOT: The Merlot wines have a beautiful raspberry-purple tone, sleek and shiny, when young. Its aromas are reminiscent of almonds and mouthfeel is clean, compact and very personal. It provides a good match in the blend with Cabernet Sauvignon and Tempranillo Cencibel or by providing a greater flexibility and lightness to the ensemble. MORAVIA: well suited wines for coupages and other varieties, especially the Grenache. They are very aromatic and high in acidity, with violet tones that highlight the varietal. It gives out a full mouthfeel and firmly structured. Its natural life is comparable to any other aging wine, although its conservation has been made in tanks or pitchers.